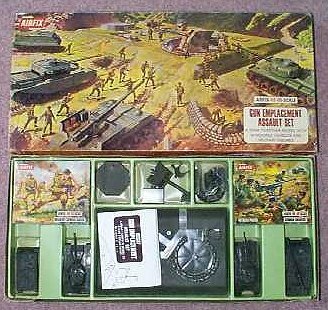 There's everything in this snap-together set for the young wargamer. The pill boxes and wireless bunker are removable and may be used independently. Ammunition is supplied for the firing gun which can be rotated and elevated. Two tanks, an armoured troop carrier and the famous 155 mm self-propelled gun are also included. British and German infantry sandbagged positions and tank traps complete this big value play set.